Clay minerals are major mineral products from water-rock interactions in the Earth crust, including during the early stages of the Earth and other planets. 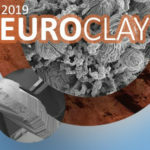 The surface chemistry of clays is of promising interest for the concentration, stabilization, polymerization, and organization of building blocks of life in the primitive Earth. This session calls for studies of clay mineral with relevance to the origin of life on Earth and elsewhere (astrobiology or xenobiology). Contributions on, but not limited to, the following topics are welcome: geological observation or synthesis of clay minerals relevant to primitive Earth surface environments, and planets in the solar system and elsewhere; characterization or simulation of clay mineral structure or surface; interaction between clay mineral surface and organics, biomolecules, nutrients, or microorganisms using experiment and simulation; reactions on clay minerals leading to the increase of molecular complexity.